1st 32, 2nd-7th 48, 8th-9th 18 <—Breakdown of skills generated per level, helps you keep track. Human1: Psionic Talent You gain additional power points to supplement those you already had. Level1: Overchannel You burn your life force to strengthen your powers. Psion1: Talented When overchanneling you do not take damage from lower level powers. Kit Includes: Backpack, Bedroll, Candle x3, Flask, Flint & Steel, Hammer, Hooded Lantern, Small Steel Mirror, Belt Pouch, Soap (1lb), Tent, Waterskin x3 and a Whetstone. Chronocharm of the Horizon Walker: Once per day, use a swift action to activate. As part of the swift action used to activate the charm, you may move up to half your speed. This movement doesn't provoke attacks of opportunity. Hailing from Haven, Ventalio and his brother Ivellios were raised in a fairly simple fashion. After Ivellios decided to attend Trevalis Academy, Ventalio decided to follow him. Although he had no ambition to attend the classes and structure that attending such a prestigious academy would bring, he did have a thirst for knowledge, and felt that the Great Library would be the perfect source for quenching such a thirst. With Ivellios' assistance, he was able to nearly freely use the Great Library's resources, developing his mind to the point of awakening mental powers. When the book in front of him lit on fire unexpectedly, he spoke to his brother, and told him what had happened. Ivellios explained to him the idea of psionics, and showed him where to find further information. Studying alongside Ivellios, even without attending classes, they both began mastering their powers. After a couple of years, they left Trevalis Academy, and traveled to Avalon, ever thirsty for knowledge, and eager to find ways to improve on their abilities. 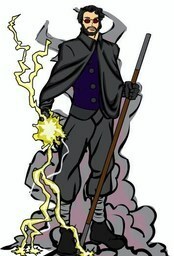 Ventalio has a fiery personality, has a good sense of humor, and loves simple pleasures. He almost always seems to be smiling, and is fairly likeable. 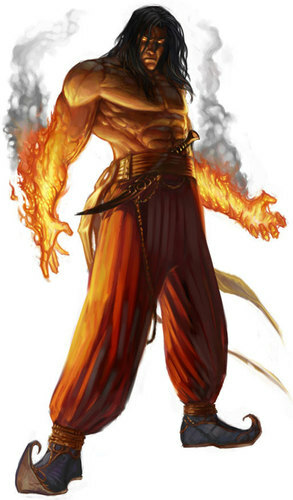 However, he has moments where he seems to slip out of himself, and occasionally mutters dark phrases in Ignan, and in combat, seems to nearly be taken over by a burning demon of himself, an ectoplasmic fire running down the lengths of his arms. His eyes turn a bright orange, and his voice seems deeper, and mixes in occasional shouts or snippets in Ignan.